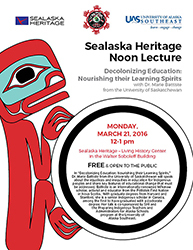 Sealaska Heritage Institute (SHI) and the University of Alaska Southeast PITAAS program will sponsor a lecture by a professor from a Canadian university on the injustices and inequities in education for Indigenous peoples. In her talk from her book of the same title, Decolonizing Education: Nourishing their Learning Spirits, Dr. Marie Battiste from the University of Saskatchewan will share key features of educational change that must be addressed in decolonization of education. “This is education not just for Indigenous Peoples, but for all people seeking a socially just society. It requires that we unlearn and eliminate racism and rebuild a spirit of reconciliation and repositioning of Indigenous knowledge and humanities as new frames for nourishing all our learning spirits,” said Battiste. Battiste is an internationally renowned Mi’kmaw scholar, activist and educator from the Potlotek First Nation in Nova Scotia. Over the course of her career, Dr. Battiste has inspired academics, students, activists, and teachers across the humanities, social sciences, and sciences to recognize and reclaim Indigenous knowledge as a valid way of thinking, writing, and being as conventional Eurocentric knowledges. With graduate degrees from Harvard and Stanford, she is a senior Indigenous scholar in Canada, among the first to have graduated with a doctorate degree, and among the first to have been elected to the Royal Society of Canada for her work in Indigenous knowledge and pedagogies that has opened new areas of research and inquiry. She has published widely and remains involved in research on Aboriginal education, languages and teachers and teacher education. The lecture is scheduled at noon on Monday, March 21, in the Living History Center at the Walter Soboleff Building in Juneau. The event is sponsored by SHI and the Preparing Indigenous Teachers and Administrators for Alaska Schools (PITAAS) program at the University of Alaska Southeast.